Caterpillars are another common bug found in your garden and they can do the most damage if left untreated. The ‘Cabbage White’ butterfly is the most common one found in your veg garden. 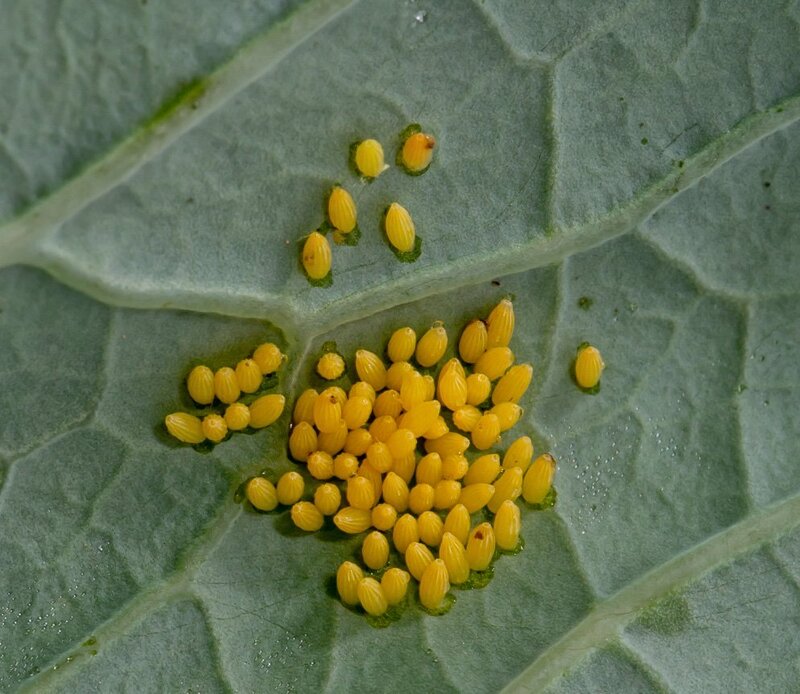 Butterflies and moths produce clusters of tiny pale yellow eggs on the underside of a leaf, which then hatch into caterpillars after about 10-14 days. Once hatched they eat away on the host plant and produce dark green/brown droppings. Caterpillars come in many different colours and some can even be hairy. (You don’t want to handle those ones as my sister did once and was left with tiny spikes in the palm of her hand.) Butterflies and moths come in lots of different shapes, sizes and colours, if you see them flying around your garden then you are more than likely to have eggs somewhere. Lots of tiny holes in your leaves that gets bigger and bigger with droppings not too far away from them and in my case half my cabbage plants gone after going away for a few days! Usually found on brassicas i.e. cabbages cauliflowers, sprouts etc. If you look on the bottom side of the leaves, you will see the yellow oval shaped eggs, usually in a group but you may see an odd one on its own. These can be easily scraped off with your finger and washed down the drain. If you see any baby or adult caterpillars on your plants pick those off and place in a bowl of soapy water or I feed them to our resident robin. If you have too many caterpillars then ‘Dipel’ is what you need. This biological treatment is sprayed all over the plants, don’t forget to spray under the leaves and get into the curled ones. The caterpillars digest this which will poison them and after about 4-5 days they will die. It is harmless to your plants and any other bios you have in working in your garden. The sunlight will naturally breakdown any remaining residues so you may need to re-apply if you still have caterpillars. Sticky traps are also handy and will help catch any other bug hanging around! Prevention is better than having to treat your plants, so try and use butterfly nets to prevent them from laying there eggs, if that’s not possible then keep checking for eggs, and remove the as soon as possible. Place bird feeders in your garden, this will attract the birds in and they can help you with the caterpillars. Never spray your plants on a very sunny day this can scorch your plants.